With all the excitement of moving to Aperture I forgot to post a Photo of the Week last weekend, and I’ve only just noticed my oversight now. Better late than never I guess! Normally I don’t choose very recent photos for Photo of the Week because I want to be sure to only pick photos I really and truly like, and not just ones that I like at the time. If I still like a shot a few months after I took it, chances are it really is good. However, today I’m breaking that ‘rule’ and posting a shot I took only two days ago. 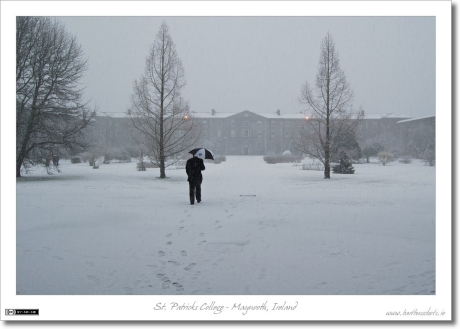 I’ve been in NUI Maynooth for about 11 years (first as a student, then as an employee), and in all that time it has never snowed while I was on campus. Until Tuesday afternoon that is, when the place was blanketed with snow. I didn’t even wait for the snow to stop falling to get out there with my camera, and I’m glad I didn’t, or I’d never have gotten this shot! I love looking at pictures of snow and this one actually took my breath away . This is gorgeous thank you so much for sharing this with everyone.